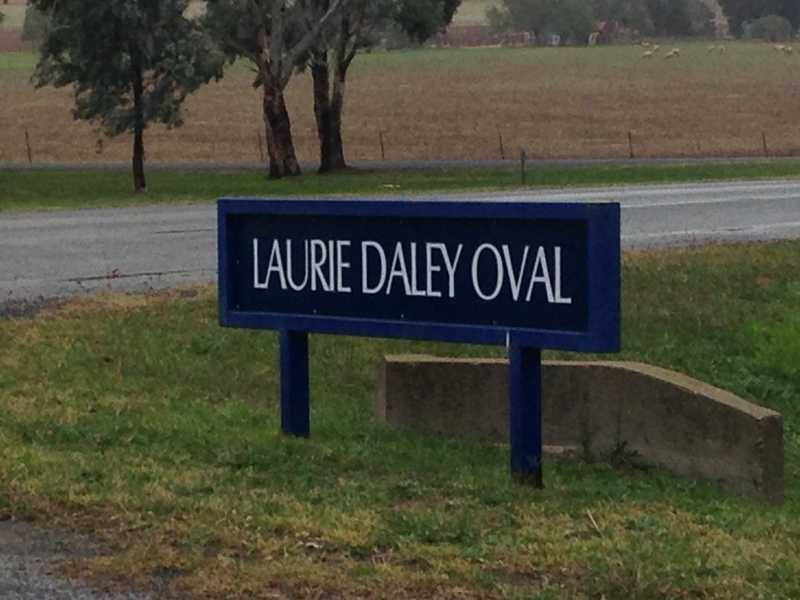 Laurie Daley Oval (LDO) is located on the western outskirt of Junee, roughly 40 km north of Wagga Wagga. 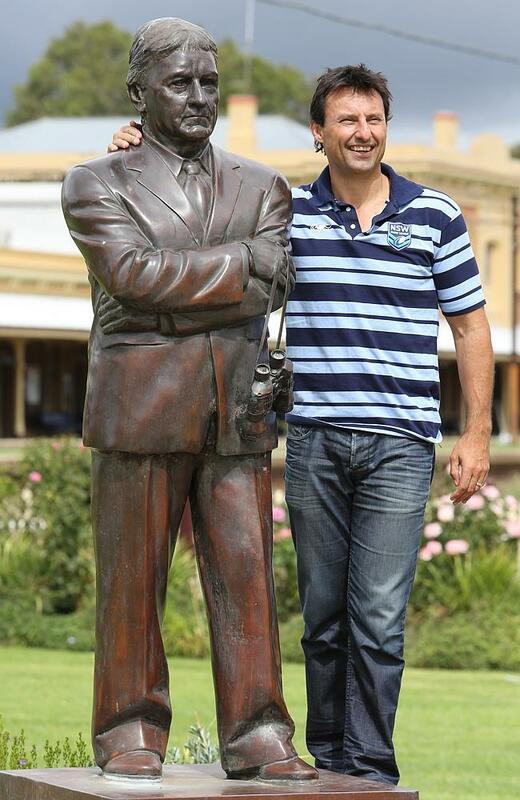 The ground is a tribute to Laurie Daley, one of Australia’s greatest Rugby League players. Daley was born and raised in the small town of Junee, before relocating to Canberra as a teenager to pursue a First Grade career with Canberra Raiders. He went on to play 200 games for the Raiders as well as captaining NSW and Australia, and is currently the coach of the NSW State of Origin side. With such a career it was a “no-brainer” for the people of Junee to rename Willow Park in January 2013. 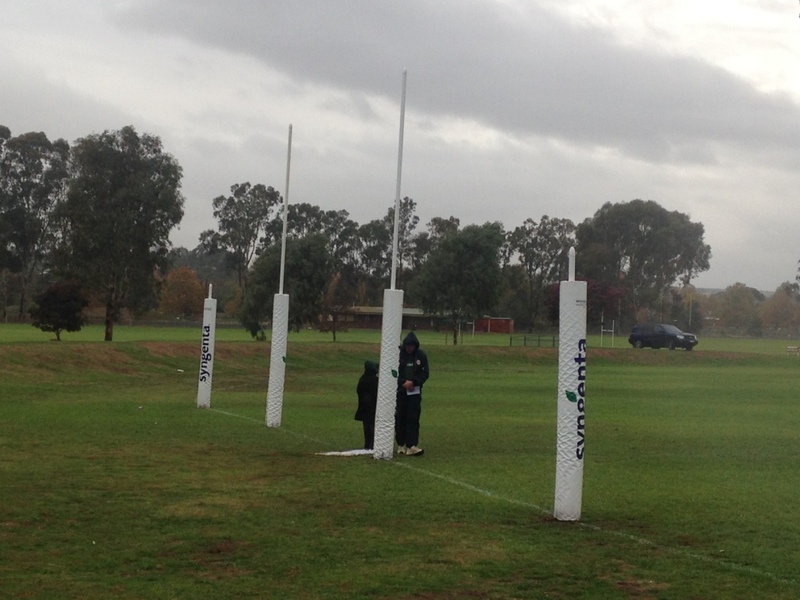 LDO plays host to the Junee Diesels Group 9 Rugby League Club, where Daley played all his junior footy. On the day that these photos were taken, though, League had been usurped by Aussie Rules. One of the joys of living in an area smack bang on the mythical “Barassi Line” is seeing the various football codes living in harmony. It was on a Sunday afternoon, as I made my post-work commute from Junee to Wagga, that I passed the oval and was surprised to see a game of Aussie Rules being played. Not being one who can simply glimpse a game of footy and keep going about my business, I had to pull in for a few minutes. Coolamon were playing North Wagga, in the Wagga and District Junior Football Association. It was a Coolamon home game but due to their senior counterparts using Kindra Park in Coolamon, the boys had to travel the half an hour drive to neighbouring Junee. 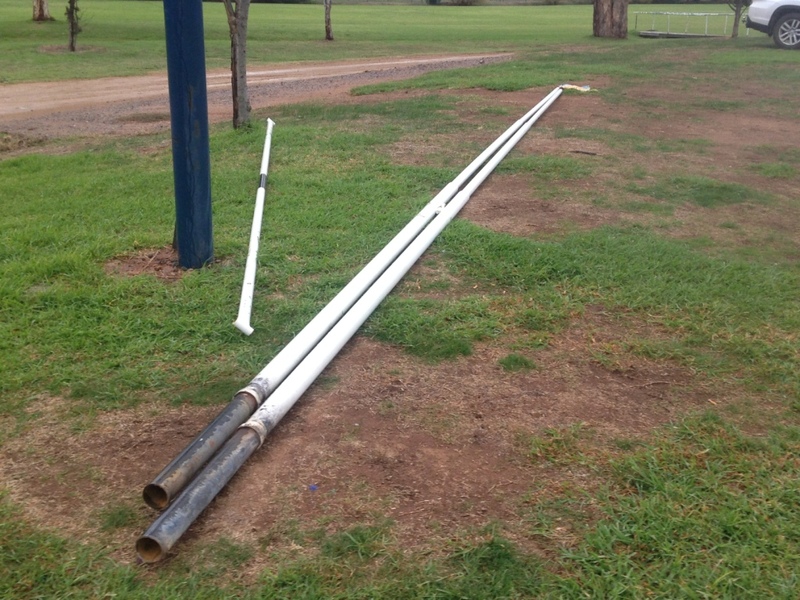 The Rugby goalposts lay dismantled on the hill behind the temporary Rules goalposts. Like a temporarily wounded warrior, Rugby would soon reestablish itself as the master of this terrain. The scoreboard at LDO is an elevated digital scoreboard. It’s controlled from the scorer’s box that was rebuilt and upgraded when the name was changed from Willow Park. 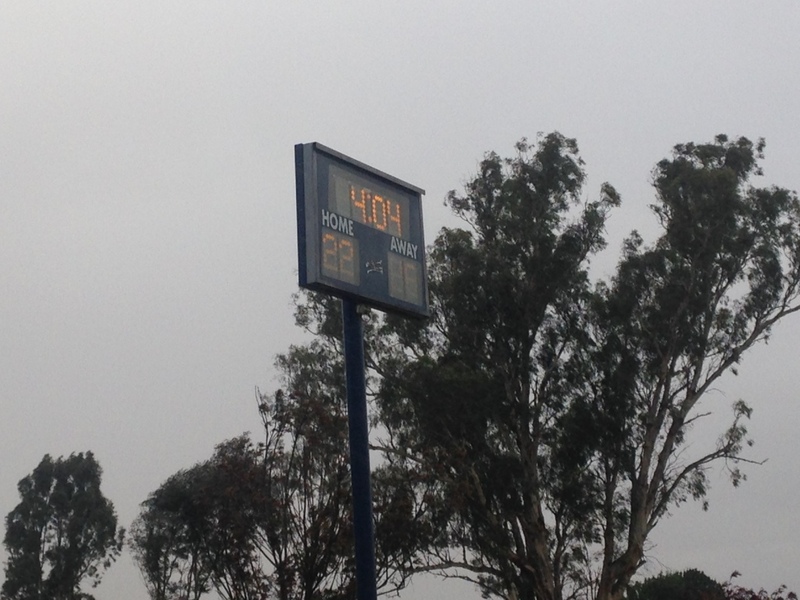 The fact that the ground is primarily used for League is evident in the scoreboard’s limitation of only two digits allocated for each team. Perfect for keeping a League score, not ideal for Aussie Rules. Thankfully for the scorers, this day was a cold, wet and windy one on which neither side was likely to reach triple figures, so there was no need for a contingency plan. If there’s one thing outsiders know about the Riverina it is that there is a rich sporting history, almost unparalleled anywhere else in the country. Sport is embraced ‘round these parts. Whether you play hockey, softball, footy, cricket, croquet, netball, tennis, golf or lawn bowls, there is a ground or a green or a court for you and if there isn’t, one will be made available. Forget about “code wars” in the Riverina, everyone’s a winner. Two Junee boys, hamming it up in the centre of town. Legendary commentator Ray Warren (left) and legendary Laurie Daley. Joshua Pinn is Scoreboard Pressure’s Riverina Ambassador. He’s also a footy blogger and podcaster at The Footy Gospel.